FAMILY FUN: Australia Day revellers enjoy free rides at Rippleside Park. Thousands will flock to Rippleside Park on Australia Day to celebrate with rides, amusements, family activities and more. Event organiser of 18 years Ron McVilly encouraged locals to join up to 5000 revellers for the free event. “The aim is to put on a day that costs very little,” he said. For decades Geelong Australia Day Committee volunteers, local groups and businesses have supported the event. “Without their help we couldn’t run it,” Ron said. As long-time president of the committee Ron enjoys meeting new Australian citizens embracing their new homeland. “It’s great seeing the different nationalities who are joining in from all corners of the world,” he said. Rippleside Park celebrations feature more than 40 free family and children’s activities from 11am to 4pm on 26 January. Entertainment includes Dame Edna Average with giveaways, Dazzling Dan’s magic show, Stilt Divas and Willow Star Entertainment. The day also features giant slides, jumping castles, amusement rides, face-painting, displays and more. Geelong Military Re-enactment Group, Geelong Scottish Dancers, Geelong Memorial Brass Band and local musicians will also perform. Families can bring a picnic lunch or purchase food from a variety of vendors at the site. 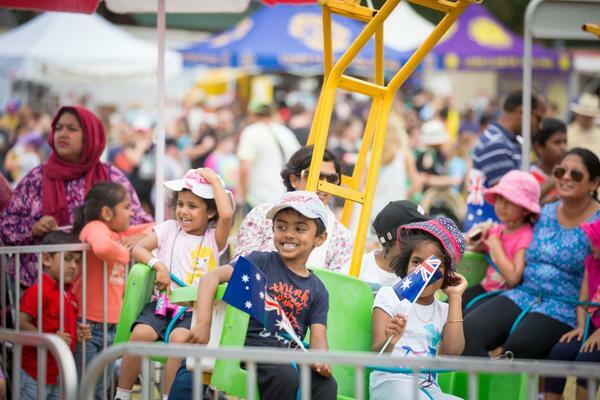 Australia Day Free Family Fun Day features an official flag raising ceremony with the Australian National Anthem at 1pm.